Redefine your SWIMMING EXPERIENCE. COOL THE POOL with Swim Elite. BREAK FREE – Falls, tears, scratches or tears? We know it happens often. That’s why we designed these swimming goggles to be super-resistant, extremely durable and made out of the absolute best materials. PULL IT OFF – Hard to adjust? Our adjustable system comes in really handy. Just pull the dual head-strap from either side to adjust the goggles with one move, even when you are in the water. MAKE IT CLEAR – Blurry vision? Now, you can keep your eyes open. A special ANTI-FOG layer for mist free vision & special impact resistant polycarbonate lenses with an 180-degree wide-angle view. The lenses are MIRRORED and completely ANTI-UV. ONE SIZE TO FIT THEM ALL – Our goggles are designed to custom fit every type of smile. SNAG FREE – The high quality silicone strap feels soft and won’t snag your hair. FACE EMBRACE – It’s possible to forget you have them on. 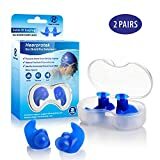 The super-soft silicone frame and nose bridge are ERGONOMICALLY designed to protect your skin and feel natural to wear even after hours of swimming. ONE CLICK AWAY – Now it’s easier to put your goggles on or to take them off. One second and it’s done. While stock lasts, we’re offering a valuable special add-on with our goggles: our top-rated Swim Elite Premium Silicone Swim Cap! Plus, you also get the Premium Case to match your premium new goggles. CLAIM YOUR SPECIAL BUNDLE NOW: We always like to offer more. 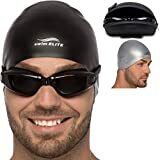 So right now, besides the Premium Hard Case to protect your new goggles (Sold at $9.95), we ALSO give you a Swim Elite Cap (sold on Amazon at $14.95) . You GET DOUBLE the value if you purchase today. LOOK GOOD – 6 SWIM GOGGLE FEATURES every made for your needs: (1) Silicone cushions for comfort, (2) 100% U.V. Protection, (3) Anti-Fog Coating, (4) Anti-Shatter Lenses, (5) Mirror Coating, (6) Adjustable Head-Strap. 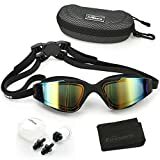 SWIM GOOD – BETTER UNDERWATER VISION for your swimming experience: The 180 Degrees field of vision coupled with the NO BLUR and NO GLARE finishes reduce tunnel vision and allow you to see clearly every time. 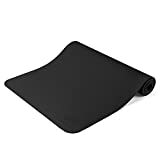 FEEL GOOD – FULLY LEAK PREVENTABLE TECHNOLOGY for your comfort: The soft silicone frame and nose bridge are not only designed to be comfortable, but they create the perfect amount of vacuum to KEEP WATER OUT. This way, you can protect your eyes from the chlorine that might irritate them. Plus, you put them on and take them off with just ONE CLICK. Easy-peasey. ALWAYS BE ENTIRELY SATISFIED: Our goggles are tested by professional swimmers and instructors, but if they don’t get your seal of approval, we’ll do our best to fix the situation as soon as possible. That’s why your order comes with a BEST QUALITY GUARANTEE. * ASK OTHERS: See how people feel about using our products. It’s usually things like “I love this!, “Looks and feels great!”, “Ranks among the top!” or simply “Five stars”.